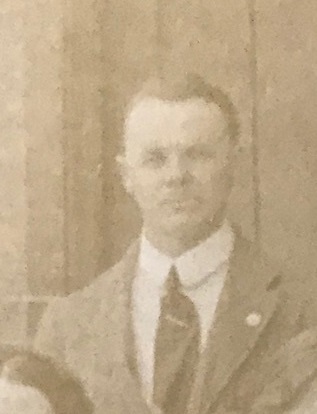 Sydney Slidel was the head teacher at Warbleton before the war. He was commissioned into the Lincolnshire Regiment and was killed in the Battle of Bailleul, near Ypres in Flanders. Sydney Robert Slidel was born at 56 Binstead Road, in the Buckland area of Portsmouth on 3 April 1882, the youngest child of Charles Slidel (1843–1913), a Royal Nay pensioner, and his wife Sarah Ann née O’Brien (1851–1933). Charles Slidel, originally from the St. Pancras area of London signed on as a 16 year old “boy 2nd class” in the Royal Navy in April 1860 and served on various vessels including HMS Minotaur, Monarch and Hector, before retiring from the navy in July 1879. He married Sarah O’Brien (from Devon) at Portsmouth in 1868 and the couple had four children (two sons and two daughters) between 1870 and 1882. At the time of Sydney’s birth, Charles described himself as a “writer”. At the time of the 1891 census, the family were living at 22 Tottenham Road, in Fratton when Charles gave his occupation as “Writer, Civil Service (Pensioner from Haslar Hospital)”. A second child, Sydney Charles, was born in 1916, but sadly only survived for seven hours. 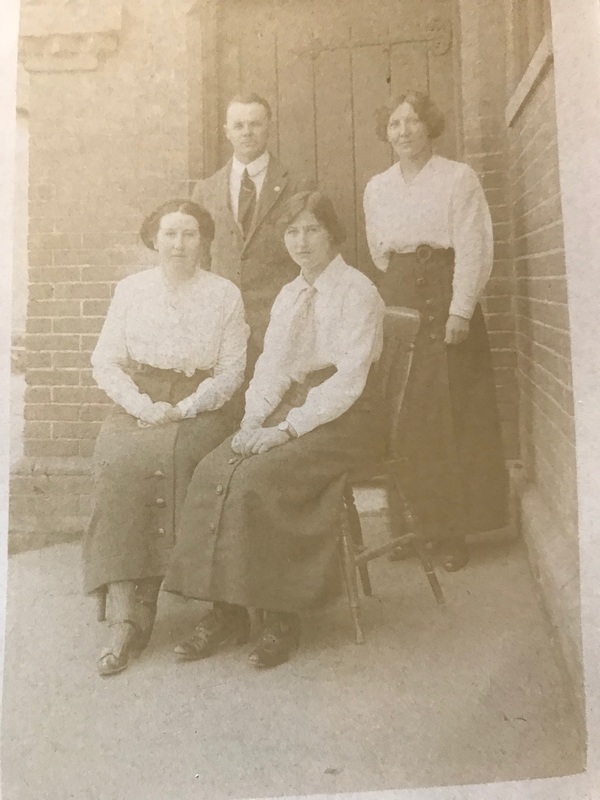 The teaching staff at Rushlake Green School, Warbleton in about 1914. In the 1901 census, 18 year old Sydney was living with his parents at 186 New Road in Buckland, and gave his occupation as “pupil teacher, school board”. After attending Winchester Training College, he appears to have remained in Portsmouth until the spring of 1909, before taking up a post at East Street Boys’ School in Eastbourne. He remained in Eastbourne for three years, before he was appointed as head teacher at the village school in Warbleton, near Hailsham in 1912. Sydney was initiated into St. George’s Lodge No 1958, meeting at Portsmouth, on 13 January 1909, alongside William Southon, a draughtsman. Both men were passed to the second degree on 10 February and raised to the degree of a master mason on 10 March 1909. Following his move to Eastbourne, Sydney joined Anderida Lodge No 2434 on 15 December 1909, resigning from St. George’s Lodge the following June. On 14 September 1904, Sydney enlisted in the 1st Volunteer Battalion of the Hampshire Regiment based at Winchester. Originally founded in 1860 as a home defence measure during the Crimean War, the Volunteer Battalion became the 4th Battalion, The Hampshire Regiment in 1908. Sydney completed his service with the Hampshire Regiment on 31 March 1908, having attained the rank of lance sergeant. In May 1909, Sydney enlisted in another volunteer battalion, the 5th Battalion (Cinque Ports), The Royal Sussex Regiment, with which he served until May 1912. Following the outbreak of the war, Sydney joined the Volunteer Training Corps based at Herstmonceux, where he worked as an instructor. In April 1915, he was “commissioned” as platoon commander. On 17 November 1915, Sydney enlisted at Eastbourne into the 2/4th Battalion of the Royal Sussex Regiment with service number 3749 (later changed to 201226) and was immediately promoted to sergeant. The 2/4th Battalion was a home service (“second line”) unit based at Horsham until September 1916, when (now the 4th Battalion) it moved to Tunbridge Wells. In January 1917, Sydney was recommended for training as an officer. His application was accepted on 5 May, as a member of No 7, Officer Cadet Battalion based at Moore Park, Fermoy in County Cork, Ireland. On 21 August 1917, he was commissioned as a (temporary) second lieutenant in the Lincolnshire Regiment and, after another brief period of training, he was sent to the Western Front on 17 October 1917, to join his regiment. In the final three months of 1917, the regiment (part of the 177th Brigade of the 59th (2nd North Midland) Division) were engaged in fighting around Cambrai, suffering heavy casualties with over 500 men killed. As a result, the regiment was re-organised in January 1918, losing one battalion, with Sydney being assigned to the new 4th Battalion. In March, the 4th Battalion were in action at St Quentin and Bapaume with further heavy losses. On 1 April, the remnants of the division moved by train to the Poperinge area in Flanders. New drafts of men arrived and on 5 April the division took over the front line at Passchendaele, without having had time to assimilate or train the new men. On 13 April, the 177th Brigade were moved to defend the line west of Neuve Eglise (Nieuwkerke) at a position known as Crucifix Corner. At 12 noon, the bombardment began, Crucifix Corner receiving marked attention. At 2:45 pm, a local attack developed against the latter place, the enemy obtaining a footing in the battalion’s line. But he was driven out by the counter-attack platoon of the left company. Again and again he attacked and twice reached the high ground in the neighbourhood of Crucifix Corner, but on each occasion was driven off with severe losses. His barrage was then shortened to the position, but his attempts were still frustrated in the most gallant manner. A heavy frontal attack against the whole line then developed. On the right, rifle and Lewis gun fire forced him back. On the left, however, troops of the 4th Lincolnshire had been forced to retire and at last the enemy broke through and captured the crest of Crucifix Hill from the eastern side. He was now able to dominate the whole of the 4th Battalion with machine-gun fire, and the Lincolnshire were forced to retire. The action then developed into a series of stands and retirements, in which hand-to–hand fighting was of frequent occurrence. Eventually a line was dug north of the railway in the rear of Hill 75, where at about 7:30 pm orders were received to retire to Locre, which was reached at about 2:30 am on the 16th. The history reports that two officers were killed on 15 April, with eight (including Lieutenant Sydney Slidel) wounded and one missing. 12 other ranks were confirmed killed with 120 wounded and 170 missing. The three casualty stations at Poperinge were popularly known by the troops as “Bandaghem, Dozinghem and Mendinghem”. 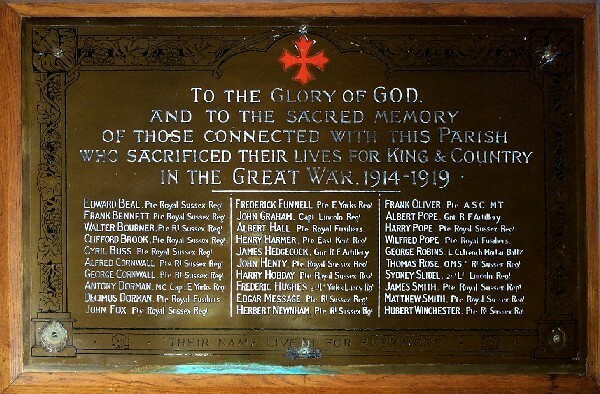 Sydney is one of 30 men commemorated on the First World War memorial plaque in St Mary’s church, Warbleton. Phillis never re-married but continued to live in Warbleton, with her final home being Vine Cottage. She died at East Grinstead on 20 October 1942. Her daughter Phillis married John Baird in 1936. She died in 1987, survived by two sons. 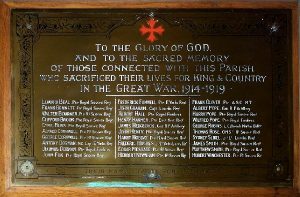 In 2016, Sydney’s war medals and memorial plaque, together with other memorabilia were sold at auction for £695. Special thanks to Roger Kenward for permission to use the photograph of the teaching staff at Rushlake Green School, Warbleton.